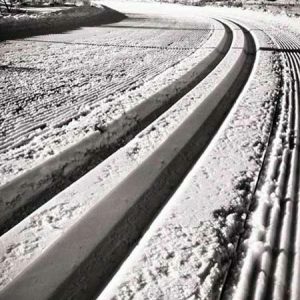 Do you nordic ski? The cross-country skiing in Montana is some of the best in the world. Did you know that Lone Mountain Ranch in Big Sky was once voted the #1 Nordic Ski Resort in North America by Cross Country Skier magazine? The next time you're looking for things to do in Big Sky, go cross-country skiing. You're going to love this cool sport. Explore Big Sky's Backyard - There are so many benefits of spending time in the great outdoors, which is one of the reasons why Big Sky is such a popular and happy place to be. There are endless cross-country trails weaving their way throughout Big Sky Country. Check out different options in Big Sky, West Yellowstone, Bozeman, and the nearby National Parks. Live A Healthy Lifestyle - Cross-country skiing provides a total body exercise that will get you in shape. It's a fun way to burn calories and to keep the body moving while developing strength, balance, coordination, and stability. Affordable – Compared to other winter sports, cross-country skiing is one of the more affordable outdoor activities during the winter season. Gear rentals are relatively cheap and trail passes are reasonably priced. Endless Adventure Potential – Cross-country skis can take you to fabulous places. There's a lifetime of exploring that can be done in Big Sky Country, but there are millions of other places where you can cross country ski too. Venture out on your own or book a cross-country skiing guide to help you fine-tune your technique and push your limits. It’s A Lifelong Activity – Cross-country skiing is an activity that appeals to all ages. Once you start, it's a sport that you can do for a very long time. Be Social - Whether you're trying to exercise the dogs or you're mingling with the neighbors, cross country skiing is a great way to get out and get to know people in the Big Sky Community. Escape From The Hustle And Bustle Of The Real World - There's something nice about disconnecting from reality and venturing out on a cross-country ski loop. It's peaceful to slide through Big Sky's winter wonderland. Leave the cell phone at home and go enjoy the fresh air and pristine, snow-covered cross-country trails in Big Sky. It's Fun! - Whether you're a novice or an expert, cross-country skiing is good old-fashioned fun. It's an activity that will bring a smile to your face. After a day of cross-country skiing, you'll spend the evening planning your next adventure. Are you convinced yet? Come to Big Sky, Montana to try cross-country skiing this winter. It might be the best thing you'll ever do. 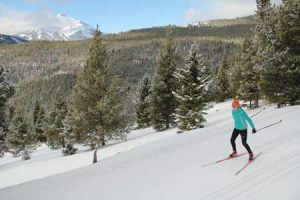 Learn more about cross country skiing in Big Sky at LoneMountainRanch.com or at VisitBigSkyMT.com.